The beavertail is the Canadian equivalent to the American elephant ear but way better. Don’t get me wrong, fried dough in any form is usually good no matter how you make it but this particular kind of deep-fried deliciousness is off the charts yummy. It’s crispy on the outside yet soft and chewy on the inside and thick enough to handle whatever you throw on it. 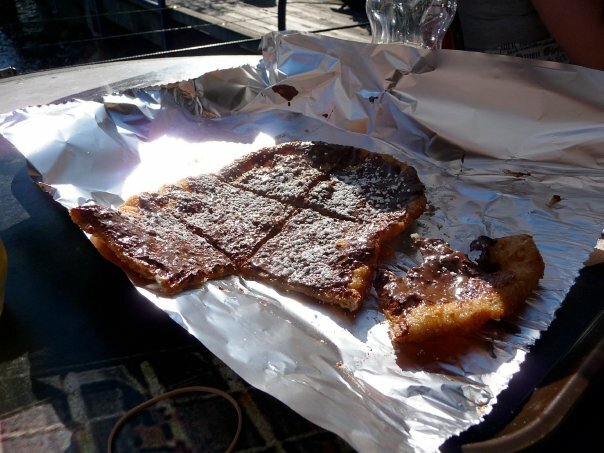 The dough is stretched into a resemblance of a beavertail (hence the name) then fried up perfectly until it’s ready to be topped with even more unhealthy goodness. I swear a bit of regret comes over me each time I eat it but I always share this so the guilt doesn’t linger too long. My order is always the same. Straight up nutella. They finish off the tail with a dusting of confectioners sugar before it’s ready to devour. Mmmm Mmmm. Is your mouth-watering yet? Because it should be! I always ask them to cut it up so it’s easier to eat and this way if you are the sharing type, you know exactly how much everyone is getting. Seriously, counting of pieces each person is allotted has happened and you’ll understand why if you’ve ever had one. You gotta protect your share of the beavertail right? I purchase this wonderful creation at Beavertails Inc. located in North Vancouver (Canada) inside the Lonsdale Quay. Check their website for all their locations. My hips are so grateful this is 6 hour drive for me. Sweet Revenge Patisserie is a cozy dessert spot located in East Vancouver BC which I’ve been dying to go to for years but their 7 pm opening time kept getting in the way until now. I’ve peaked in the window and salivated at their menu many an afternoon just trying to get a sense of what I’m missing out. I’m happy to say that I can finally cross this establishment off my “must go to” list after a recent trip this past summer and a dedicated effort to actually take time to go back there during the evening. We arrived early so our wait wouldn’t be long and we managed to get a table right away and were eager to finally try their dessert. Sweet Revenge is an intimate space with lush decor to take in while you wait for your order. It reminded me of a quaint cafe I might come across if I was strolling along the streets of Paris and just happened to wander in. The design certainly fits that style and if you’re lucky, you may just hear some Edith Piaf songs playing in the background while you sit back enjoy the sights, sounds and flavors. 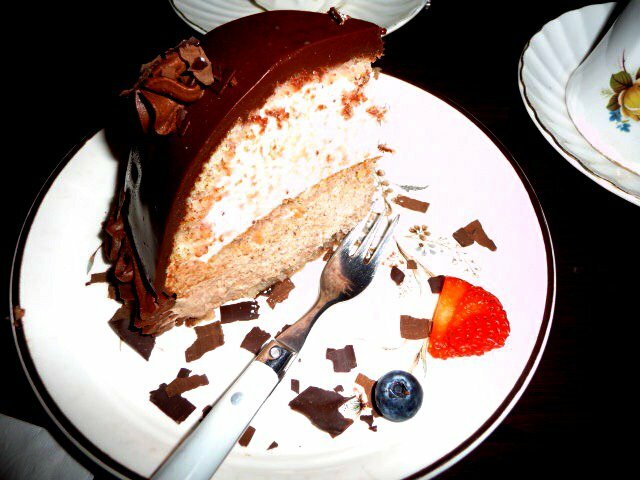 The menu is filled with homemade artisan desserts along with a selection of teas/coffees/wines and spirits. I was hoping to share a dessert called “The Smooth Operator” which was a chocolate sponge cake layered with mascarpone cheese icing and fresh raspberries, topped with white chocolate shavings and drizzled with raspberry coulis. Another table ordered it and it seemed too large for me to finish on my own so I opted for the Zuccotto, a domed cake layered with liqueured soaked sponge cake and layers of fresh berry mousse and chocolate mousse and covered with ganache. This dessert was perfect. It wasn’t too heavy and the fresh berry mousse was refreshing on that warm summer day. The cake was moist and the ganache was great. I’ve had to peel ganache away from cake if the consistency was more like fondant because who really eats fondant anyways? The ganache had a nice smooth texture with just the right amount of chocolate and sweetness to compliment the dessert rather than overpowering it with dark chocolate flavor. Your fork should never take off the entire top layer when you take a piece of it so I knew this was ganache done right. 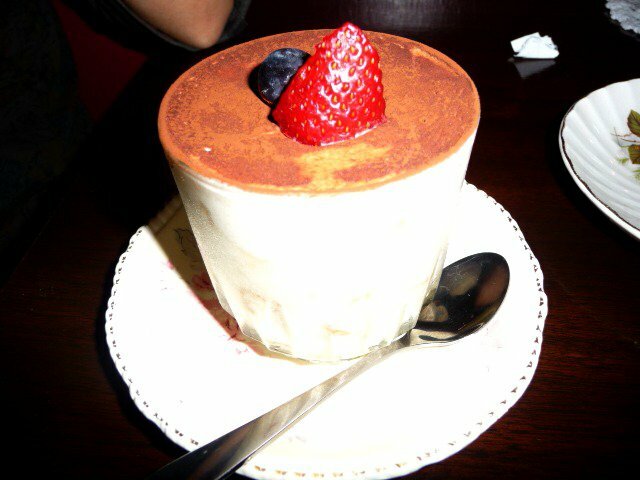 My friend ordered the tiramisu which was rich and deliciously creamy, the kind of dessert you really relish every spoonful you put in your mouth and then scrape every bit off the dish before you relinquish the plate. All the hype surrounding this place is well deserved and I would definitely go there again. The prices are reasonable and the ambiance is charming. My only complaint was the lone server who was noticeably stressed out by the amount of work he had to do on his own. They really need to know that people will wait for good food but when you see the staff showing signs of distress and then having it affect their service then it takes away from the overall experience. No need to stress over dessert! 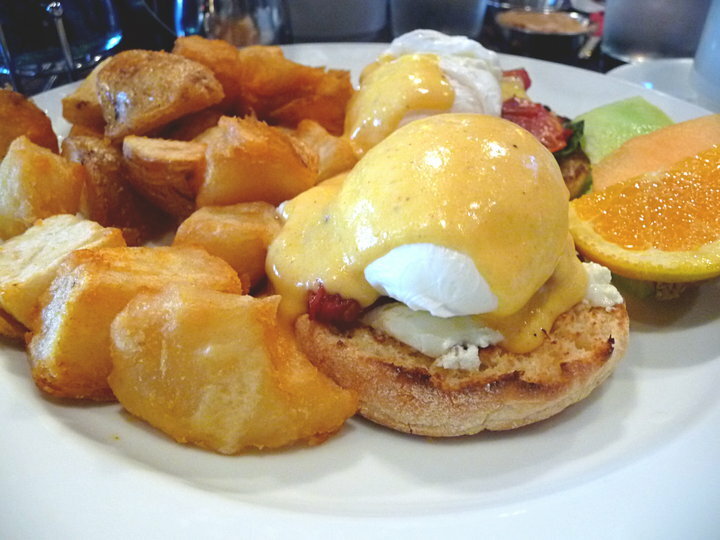 I rarely eat eggs benedicts in Portland but I’m almost sure to order it during my periodic visits to Vancouver BC. I guess it’s a vacation treat for me that I seek out and enjoy each time I’m there. My friend took me to Habit Lounge on Main Street for brunch and I liked everything about it. This place has a modern yet very 70’s feel to it…carpet on the walls and if memory serves a padded vinyl bar and paintings I expect to find in thrift stores. I was too distracted with the World Cup playing on the flat screen but I remember liking the overall vibe there. The service was good despite some of the comments I’ve read about it but it wasn’t too busy when we were there. I ordered the roasted tomato, basil and chevre benedict and it was great. The fried potatoes were delicious and not greasy at all. Definitely a place I would eat at again.